Hey there! I'm on The Cut Shoppe blog today with this layout featuring the new Butterfly Wings cut file. To be perfectly honest, I wasn't planning on using it. I love this cut file. It's beautiful. My first thought was, 'but it's not me'. Well, I sure proved myself wrong on this one. As soon as I got my hands on the Crate Paper All Heart, all I could think of was this cut file. To me, the butterfly is inspirational. The papers are so feminine. They work harmoniously. Pink, flowers, butterfly. Boom. I used only patterned papers today. I cut the butterfly out of a small pink pattern, then backed it with 3 other papers. Varying the size of the patterns kept it from being too visually overwhelming. 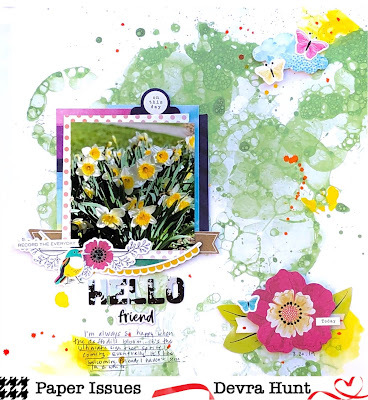 I fussy cut a few flowers layering them over the printed ones, then added few stickers and sentiments, That's all. 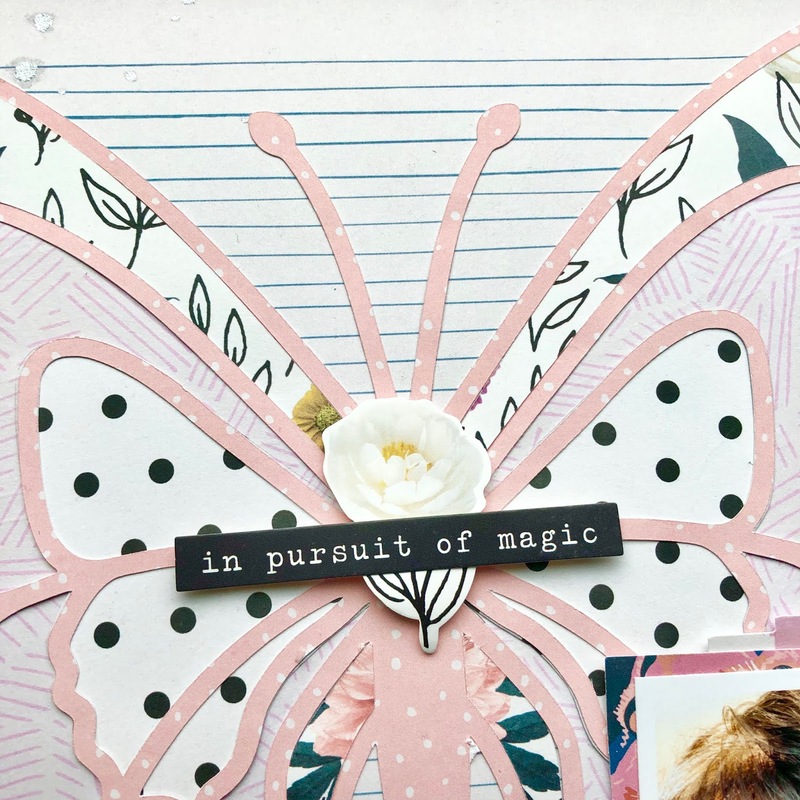 Since the butterfly itself it the focus of the page, it didn't need much embellishing! It's too pretty to cover up anyway! Thanks for stopping by my creative view today. Check out this file as well as this weeks new releases and so much more in The Cut Shoppe. Come back again. I've got ideas coming to paper soon! Hey there! 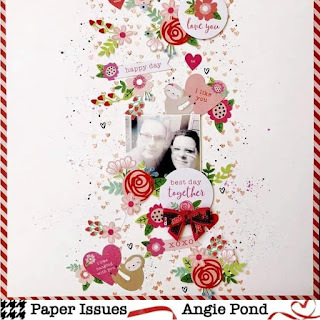 I have a page to share today that I made for Paper Issues Scraplift Sunday ! 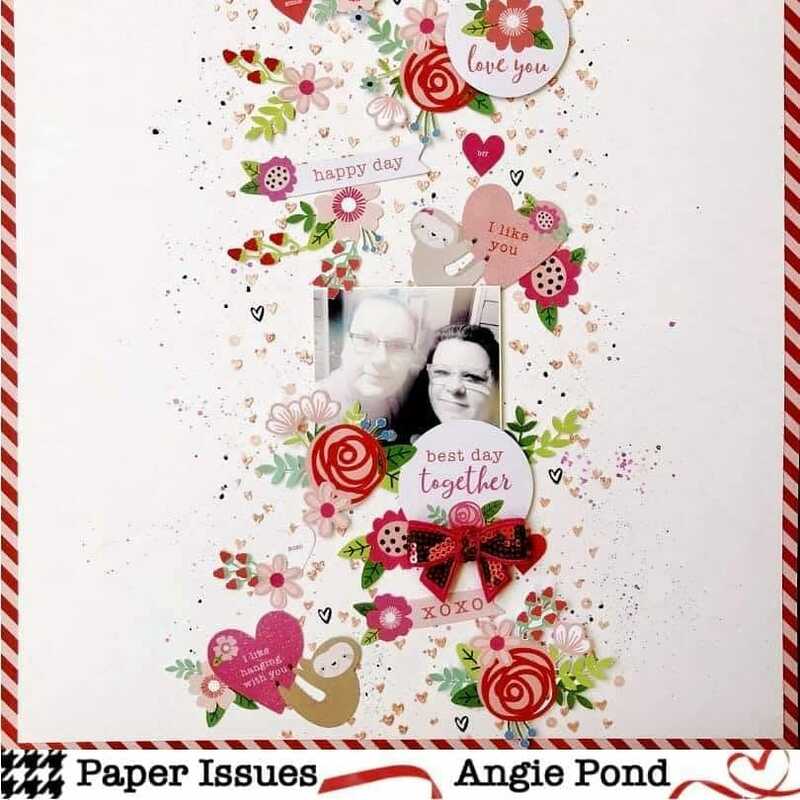 I love Angie's layout and had several ideas for it. I finally landed on this idea using the new Carta Bella Baseball collection. I liked all the elements spread through the center of the page. 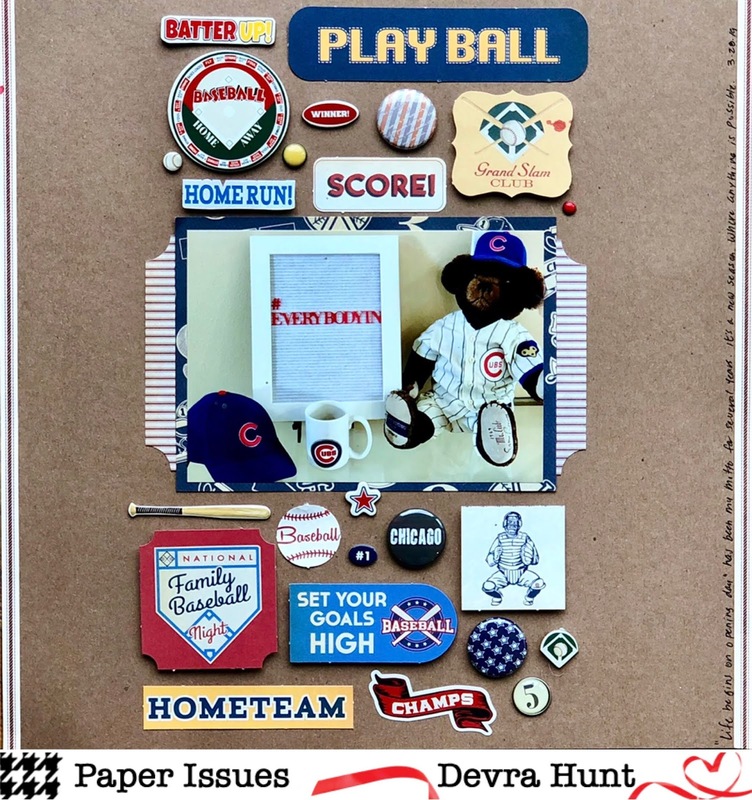 I filled it with stickers, ephemera, chipboard and of course plenty of A Flair for Buttons. I made it much more clean and simple, even with all the pieces. In case I've not mentioned this before, I love baseball. It's really the only sport I follow. As far as Im concerned, opening day should be a National Holiday. 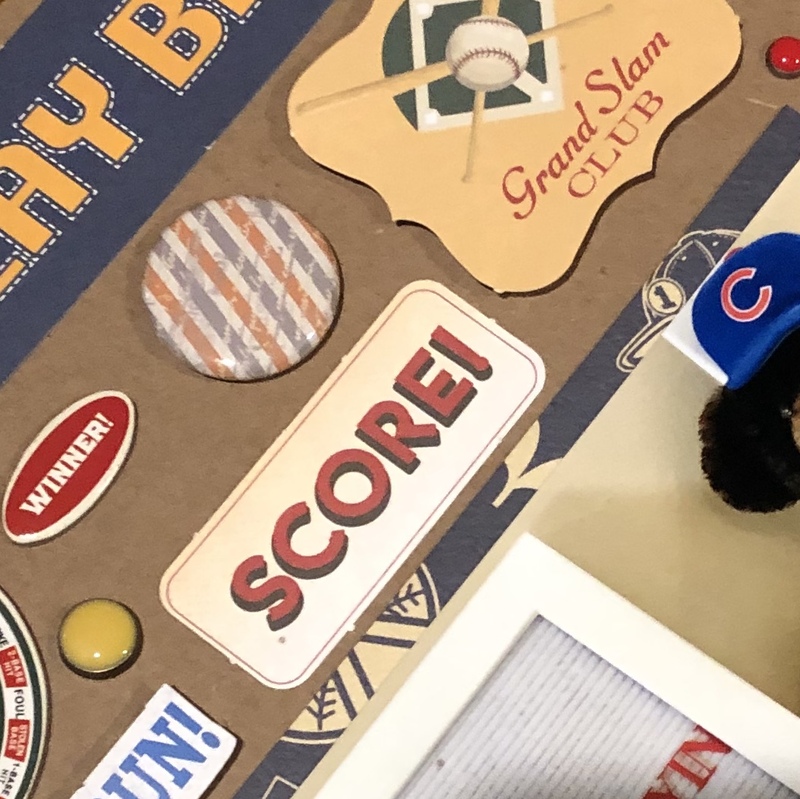 I celebrate every opening day with my own party, consisting of game after game and all the proper ballpark foods. Nothing tastes as good as that first hot dog of the season. Thanks so much for stopping by my creative view today. I have lots to share. If Im not here you can find me on Instagram . 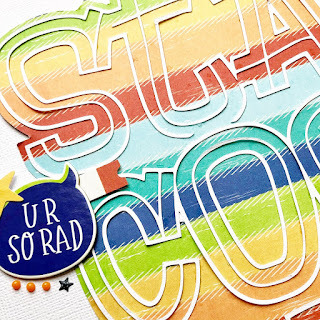 Check out all the new flair at A Flair for Buttons. Shop Paper Issues using DEVRA at checkout for 20% off your purchase. Hey there! Im on the Paper Issues blog today sharing my project for the April Showers challenge. I love when our challenges have so much room for interpretation. Did I want to go with flowers, or something else springy? Ooh Baseball starts in spring! I could do that! But sometimes I get so many ideas I don't know what to do! Well, just in time, the daffodils bloomed! I have a small group in my front yard that continue to bloom and grow each spring. Well, I went right ahead with Vicki Boutin Color Kaleidoscope. How could I not? This collection is my favorite release this year! It's bright! 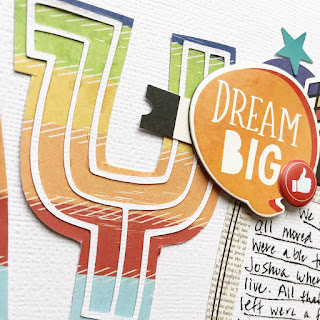 It's colorful and it's inspiring! The water color papers are pretty incredible and made it so easy! I used the Watercolor Markers to add some more colors. 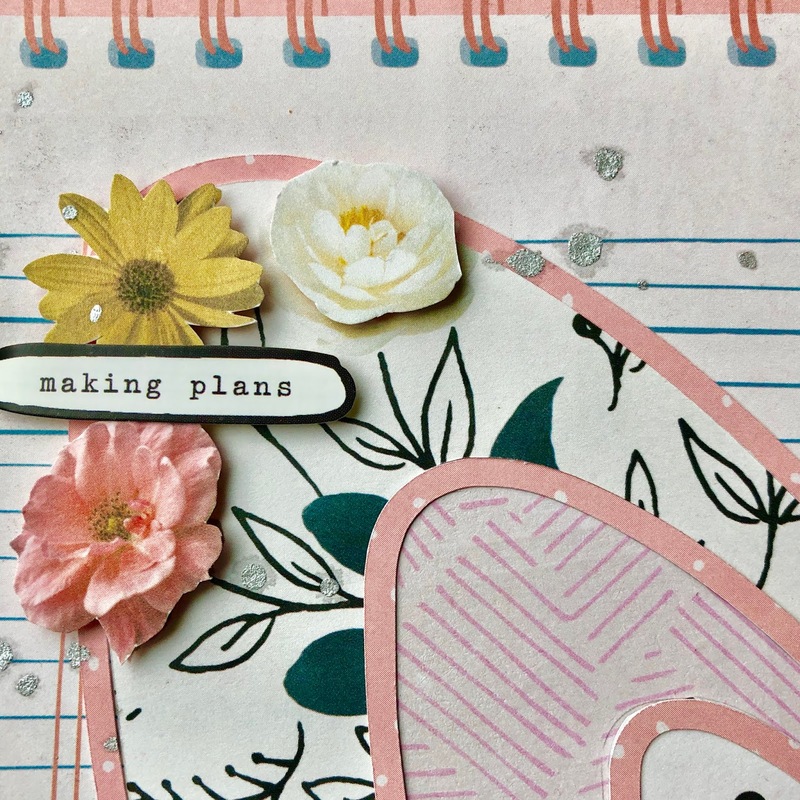 The flowers in the icon ephemera are beautiful. 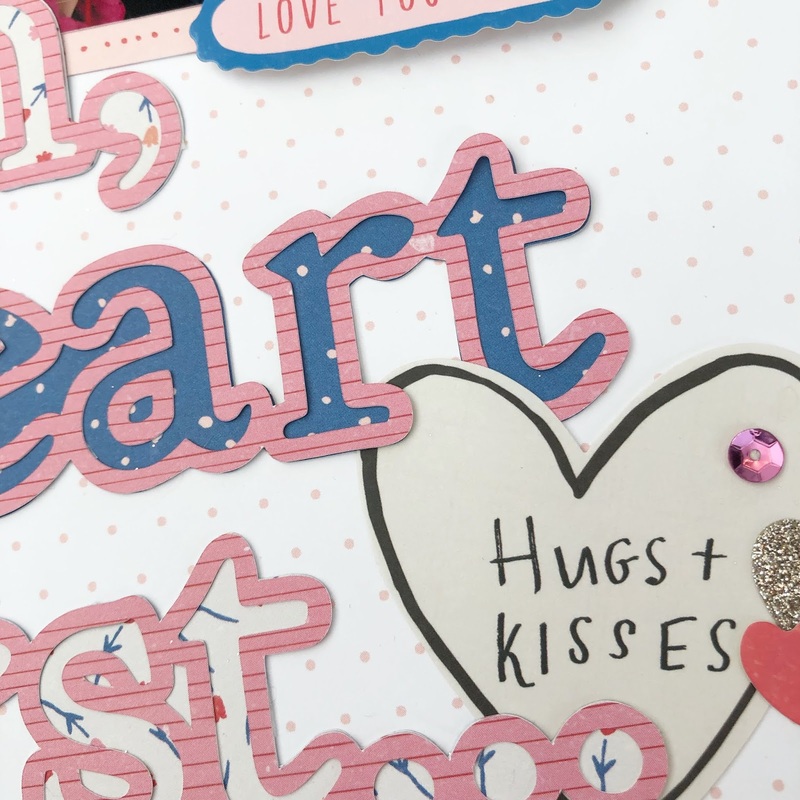 The stickers and chipboard have all the sentiments I could ever ask for! If you are a fan of layering, these are the best! All of the embellishments coordinate and work together beautifully. Thank so much for stopping by my creative view today. I hope you come back later this week to see what else Im up to! When I say you really need this collection, I mean it. It's spectacular. 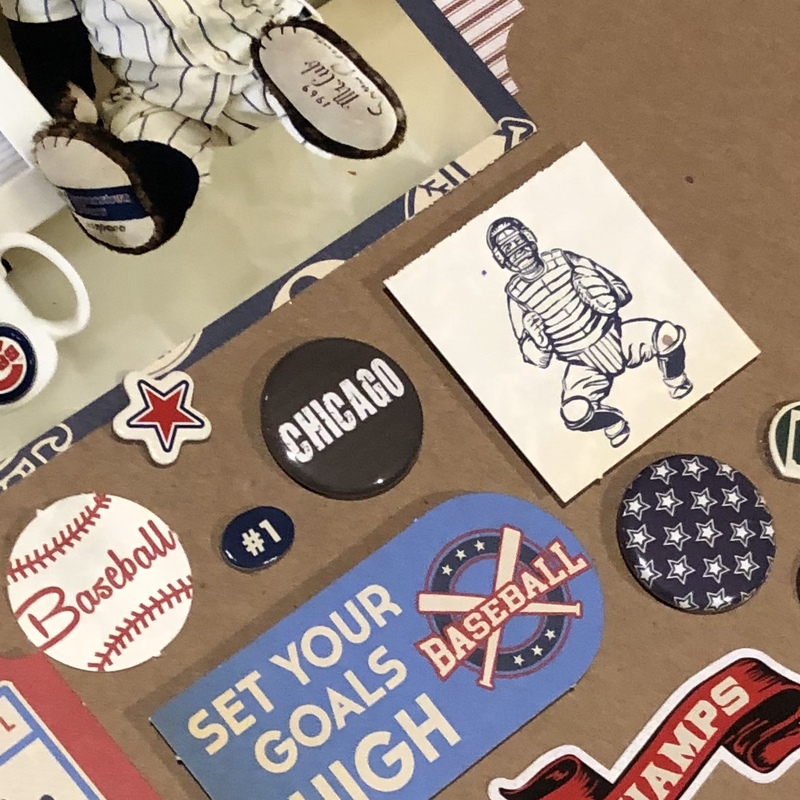 You can get it and so much more right now in the Paper Issues shop. Use DEVRA at checkout for 20% off your purchase. That's a good reasons shop right? Hello there! 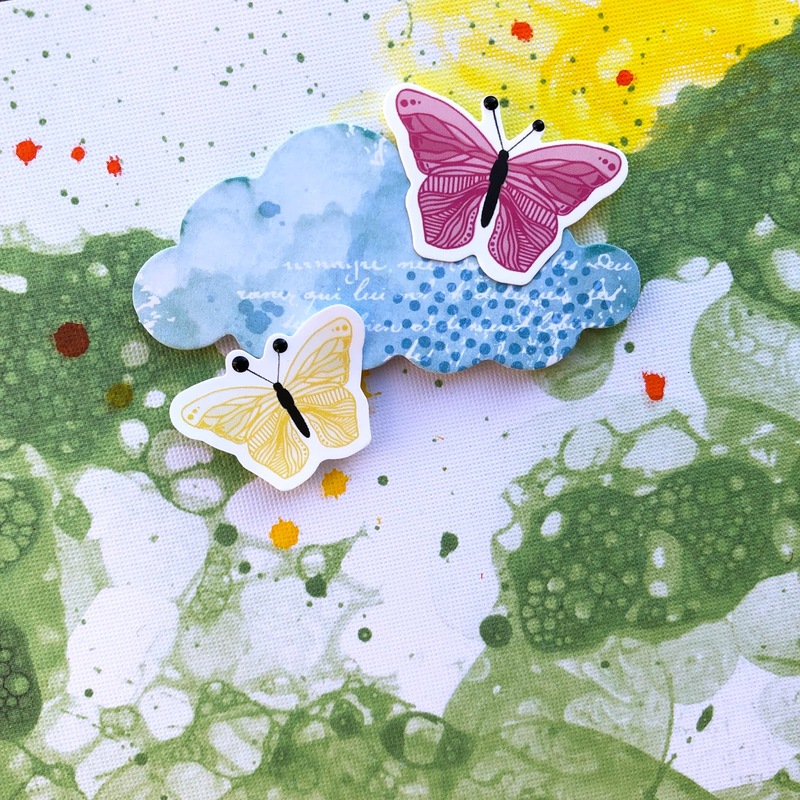 I'm on The Cut Shoppe blog today! 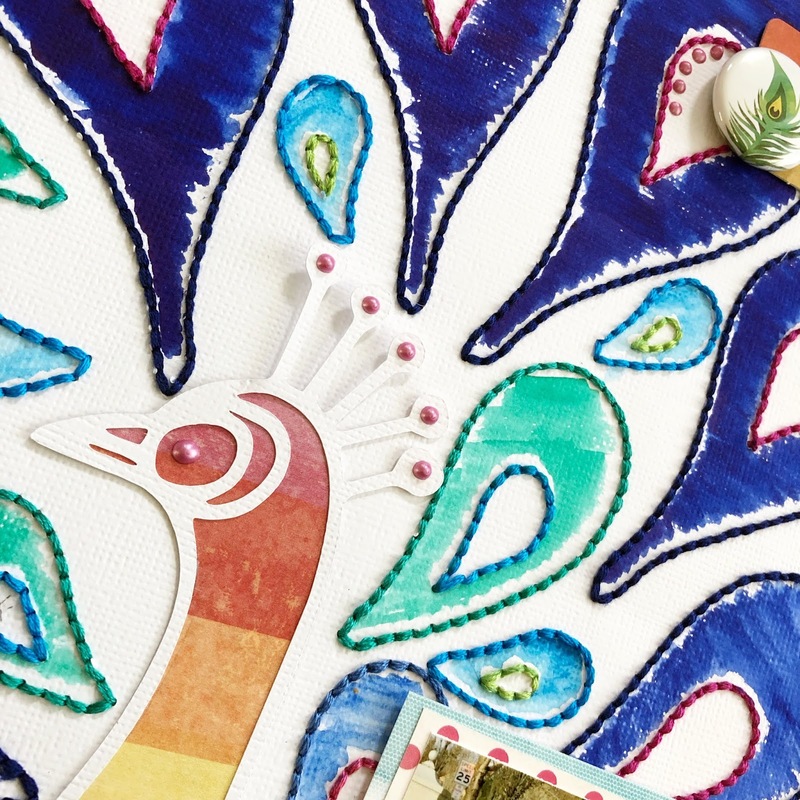 This Pretty as a Peacock might be one of my favorite cut files ever. But when I saw it, all I could think of was stitching it. So I did! I didn't have a photo in mind when I started, but I like bright colors, so I started there with bright blues, greens and pinks. 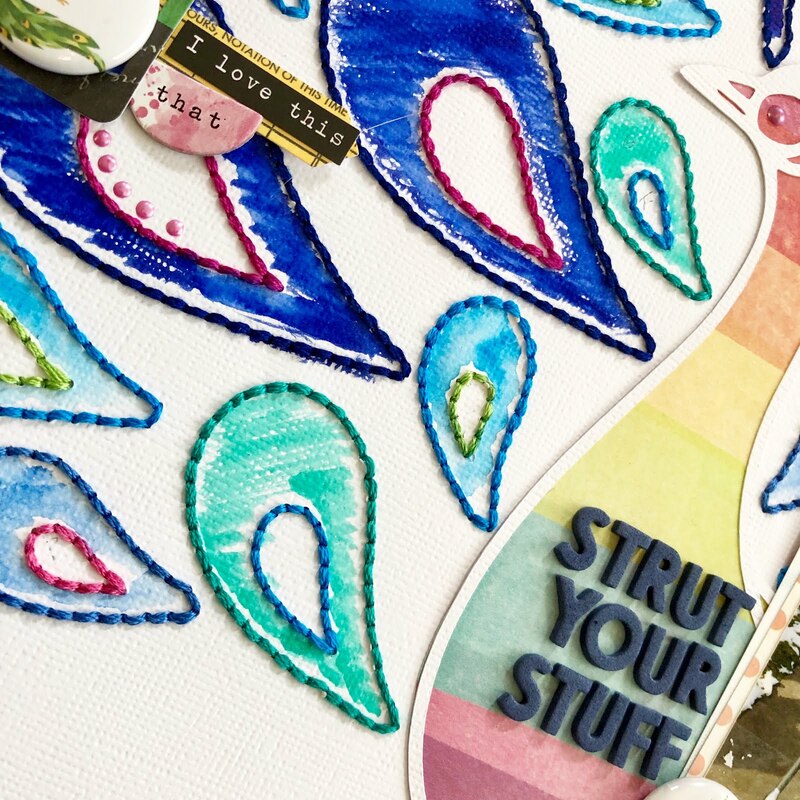 I also had the Strut Yourself flair from A Flair for Buttons. By the time I finished sewing, I had the photo, and the rest of the product. Vicki Boutin Color Kaleidoscope arrived just in time! I used the Chasing Rainbow paper behind the body of the peacock. I tried something new, using the WaterColor Markers and also the Amy Tangerine watercolor set to fill in the feathers. The colors are beyond perfect. I definitely need some practice with the markers, but for a first try I'm really pleased with the results. You can see more of the stitching in these detail photos. Like I said, I like bright colors! Thanks so much for stopping by my creative view today. 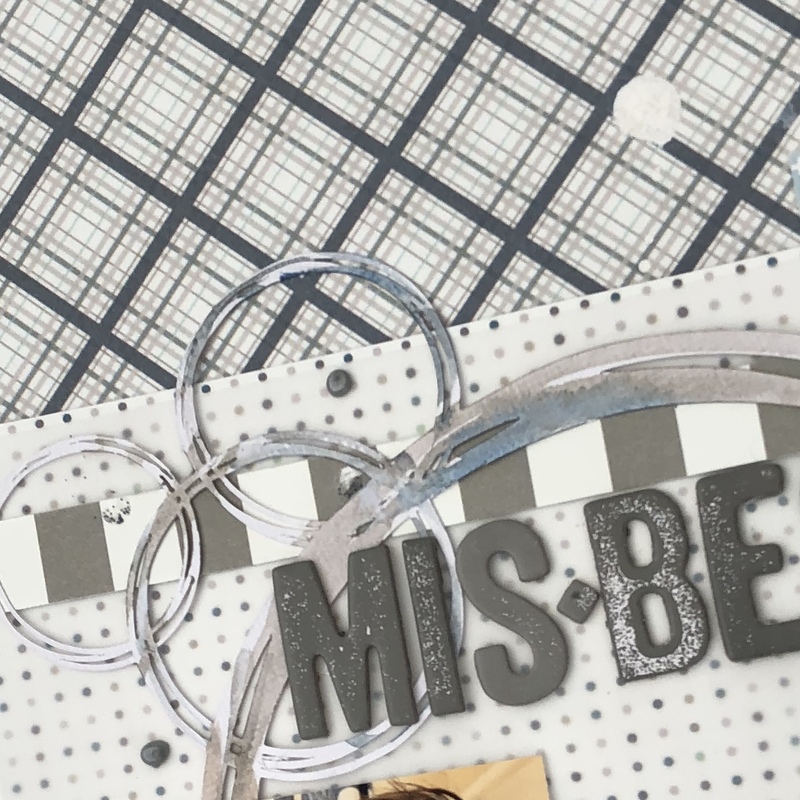 You can find this and so many incredible cut files in The Cut Shoppe. See you again soon! Hey there and good morning! I'm on the Paper Issues blog today sharing this project for the Get Messy challenge. Yep. I got messy. It's not something I do in a big way. Nope. Paint scares me just enough that I will splatter it, but not take out a brush! I do have to say, this was fun and different for me. I will say, this page was made way too easily because of this photo of my son with shaving cream all over his face. The first thing I thought of was bubbles! White bubbles! We even have this awesome Bubbles cut file! Guess what I did to it?!? I painted it with some blues and grays using the new Amy Tangerine Watercolor set. 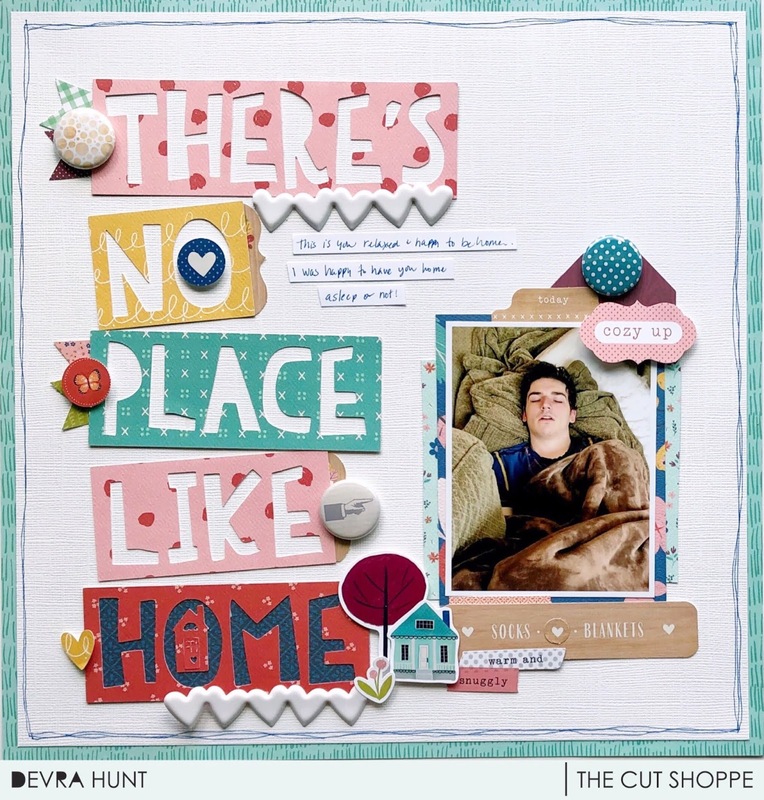 I bet you'd never guess the papers and ephemera are the new PhotoPlay Snuggle Up Baby Boy collection. Oh Yes I did. It's not just for babies! I love the masculine colors. All I did was flip the papers over to the 'B' sides and voila, they were exactly what I wanted for this page. Now for the rest of the messiness....I dipped the lid of my paint bottle into the white paint, then 'stamped' it onto the page, with some splatters too of course. I added bit of A Flair for Buttons flair for some color. It was looking a little to flat and too grey. We can't have that can we? Thanks so much for stopping by my creative view today. Head over to our Facebook Group where you can find this and all of our March challenges. There is so much good new stuff in the Paper Issues shop. Get some of this PhotoPlay or something else that catches your eye. It's always 20% off when you use DEVRA at checkout. Hey there! 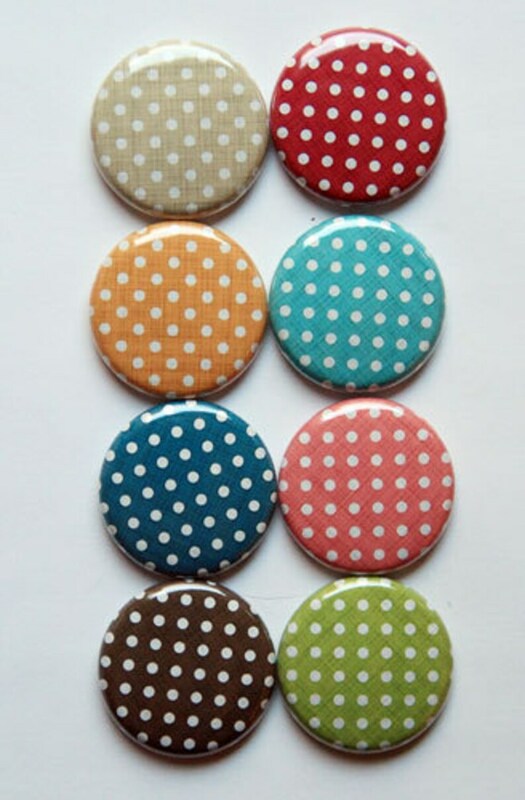 Im on the A Flair for Buttons blog today showing off the ever so versatile Linen Polka Dots flair. When I add flair to my projects, I usually grab pieces from different sets that fit whatever mood or theme I'm trying to convey. Today however, is not the case. 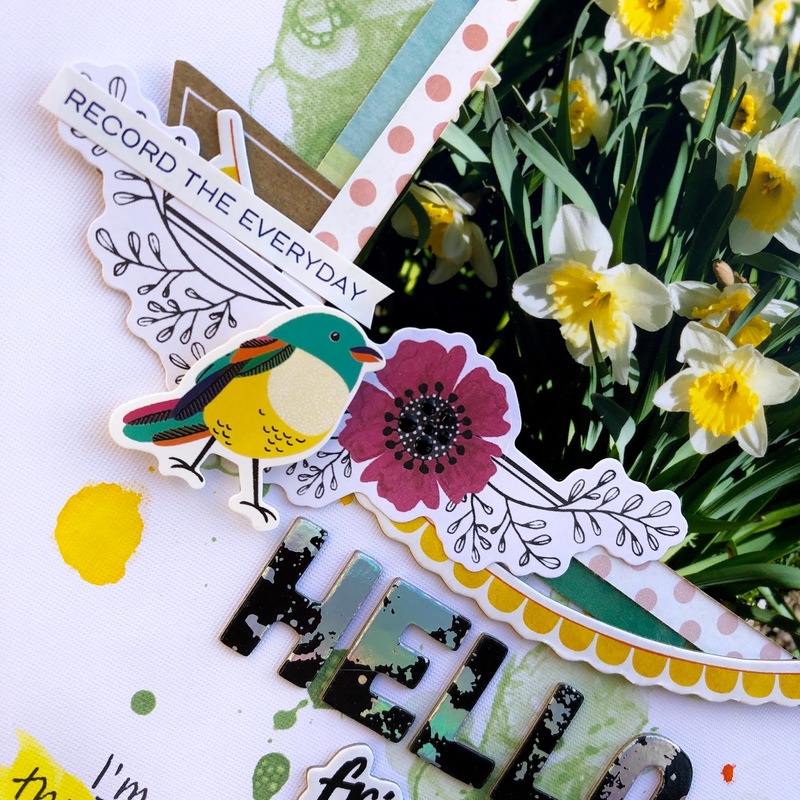 This floral wreath cut file from The Cut Shoppe is backed by so many patterns, I needed to find a way to make it feel cohesive, without making it any more busy! Using the coordinating colors and simple polka dot pattern does just that. It adds dimension too! So that's my tip for today. 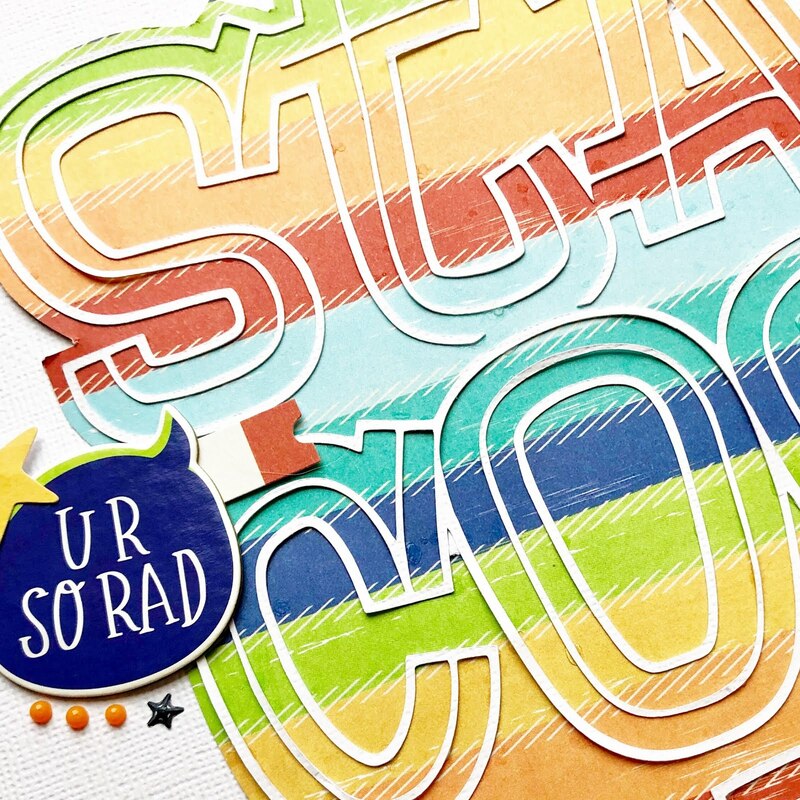 Don't be afraid to use flair from the same set on your page! Hey there! I'm sharing this layout on The Cut Shoppe blog today. 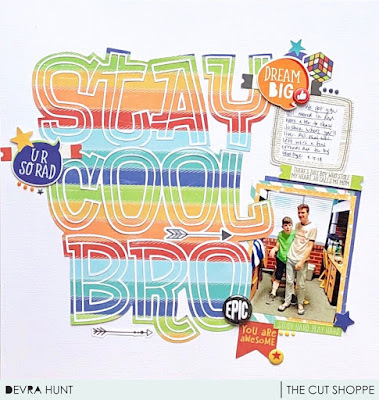 It features the new Stay Cool Bro cut file. Come on. I kinda feel like this was made just for me. There are so many ways I want to use it. Because there's always more than one way to use a cut file right? Today though, is simple. Two boys, brothers, bright colors, inspiring sentiments. Boom. There are many layers to this cut file. I used the innermost lines, backing it with the entire outline of the file. Using this Simple Stories L'il Dude brightly colored stripe highlights the cut file and gives my page so much fun energy. It really was very easy to put together! 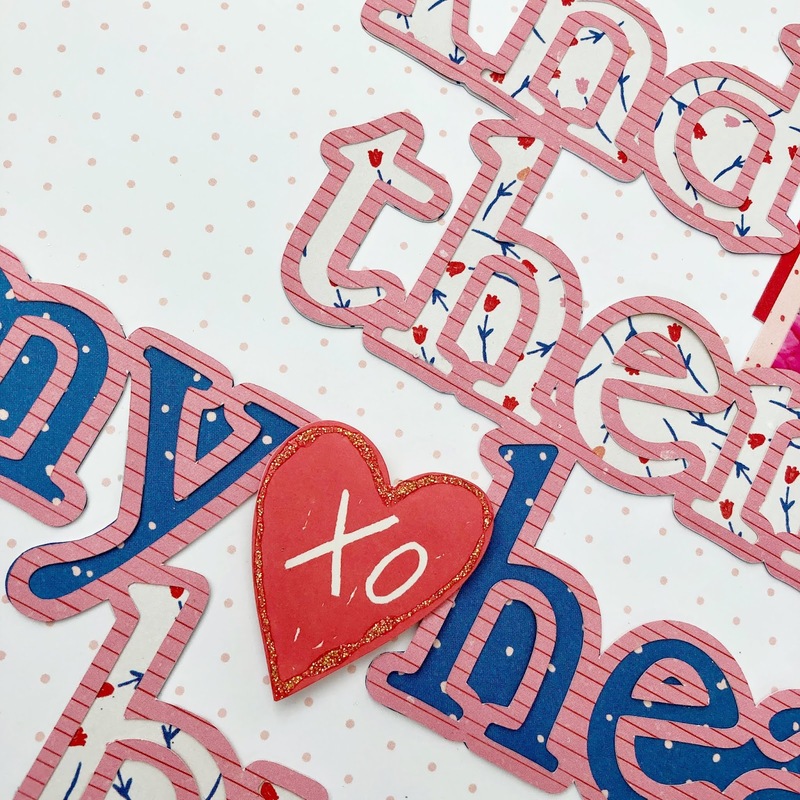 It's such a statement it only needs a few embellishments. Small clusters of mixed ephemera, chipboard, stickers and A Flair for Buttons flair finish this off perfectly. I'm so happy you stopped by my creative view today. I have so much more to share and hope you come back again soon. We love to see how you create with our cut files. Share with us in our Facebook Group, The Cut Shoppe Scrap Spot. See you next time! Hey there! 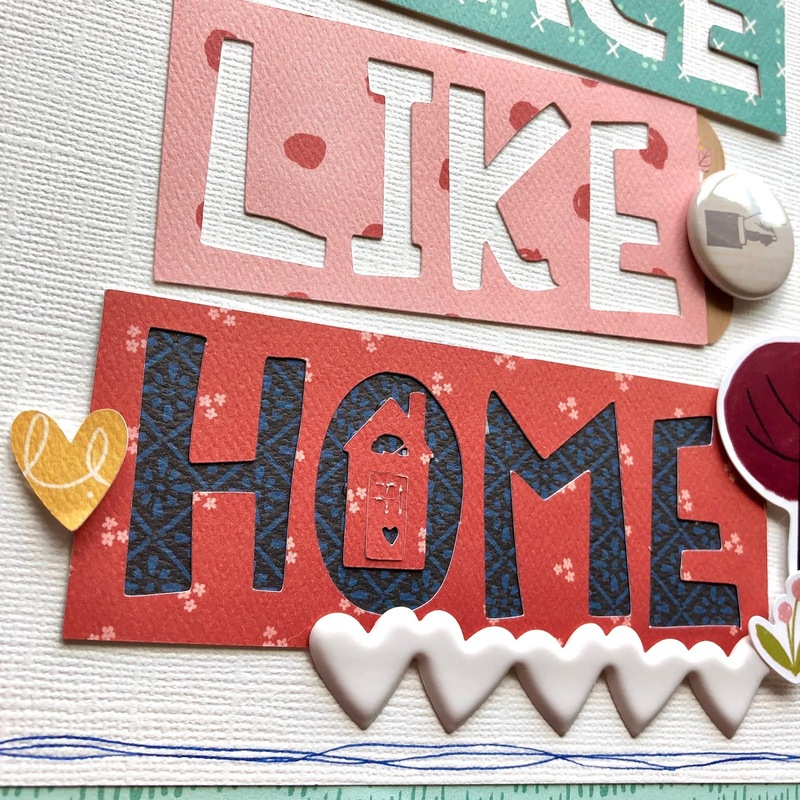 It's my turn on the Paper Issues blog today showing off one of our FREE cut files. 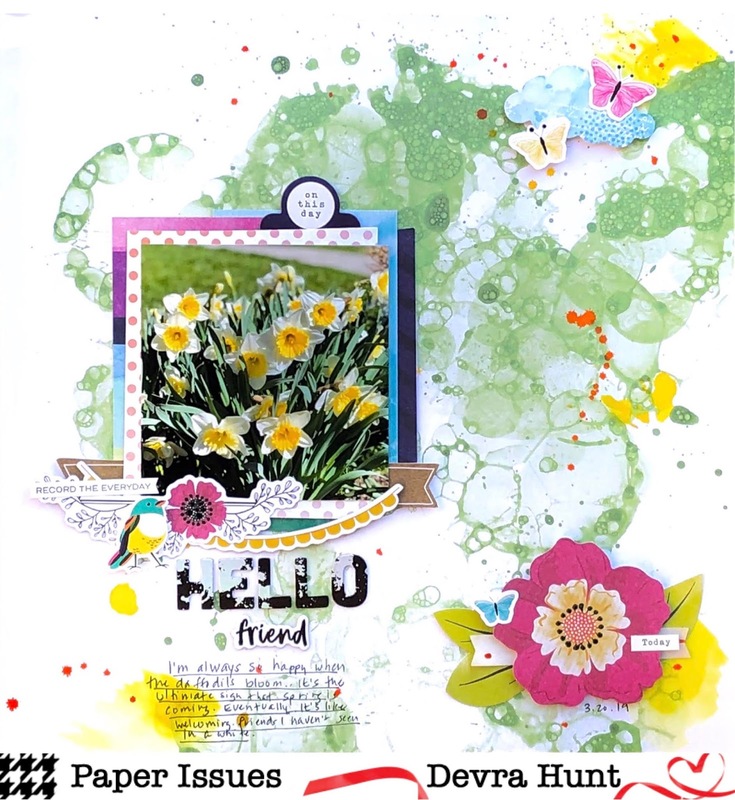 Did you know Paper Issues has hundreds of FREE cut files available to download? Did I mention they are FREE? Well anyway, I love our cut files and use them every chance I get. What makes them fun for me, is using them in unexpected ways. If you've been following me, you know I like to do that with all kinds of product. 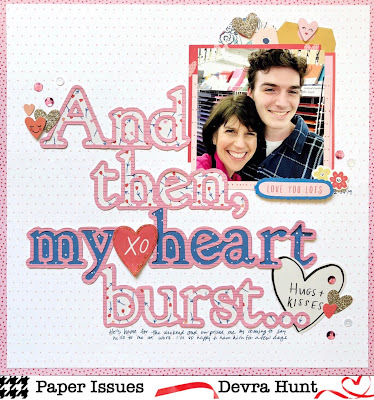 Like this one, "and then my heart burst". You do realize this was created to go along with baby collections right? Well, when I saw it, I thought immediately about my son coming home from school for a weekend to visit. My heart quite literally burst with excitement. So why not use it here! 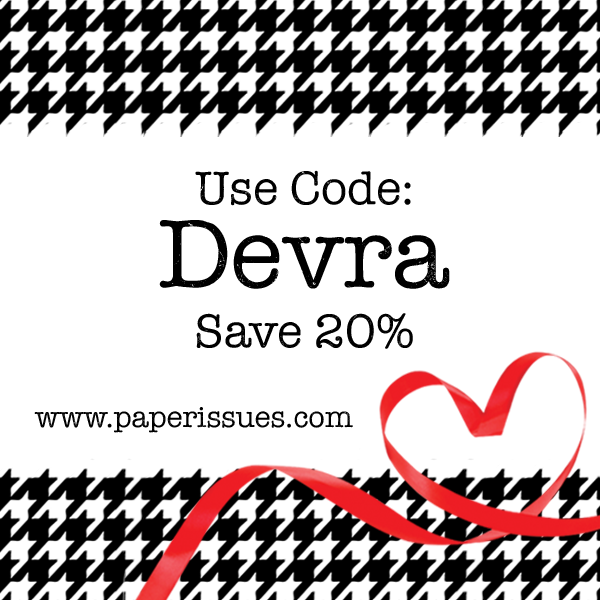 I used a sticker over the center heart just to add some more color and context. I like tucking things over and under cut files. It's just fun! Thanks so much for stopping by my creative view today. I've got a lot to share the next few weeks so come back again soon. Head over to the Paper Issues store today to get yourself some new goodies! You'll be happy you did! Use DEVRA at checkout for 20% off your purchase! Hey there! 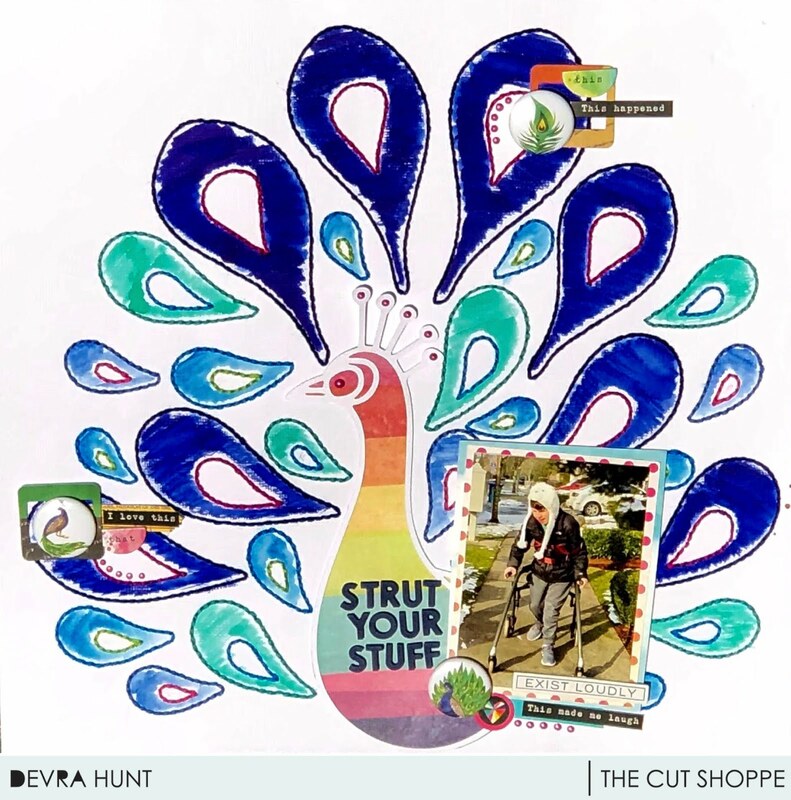 It's my turn on the The Cut Shoppe blog today. 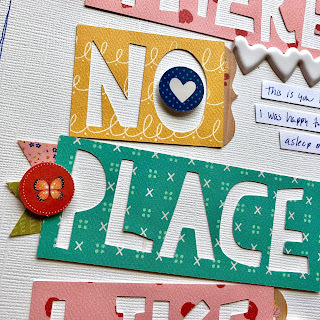 I have a simple but funny page to share today using the There's No Place Like Home cut file. I love this line from The Wizard of Oz. But hmmmm, how could I use it? Well, that was certainly solved when my son came home from school for the weekend! He woke up in the morning, came downstairs, and went right back to sleep on the couch. What I realized was that he was relaxed and comfortable. So there really is no place like home. 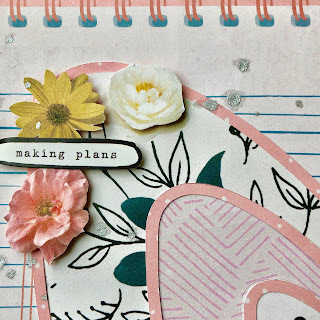 This page is really very simple because the cut file is everything! It's the title, embellishment and focal point all in one. 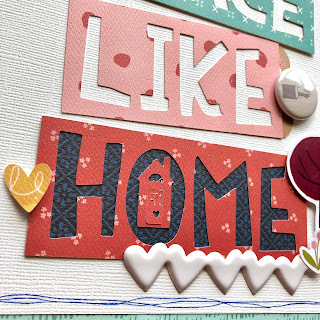 I cut each word in different papers from the Carta Bella Our House collection. I glued them down a bit wonky to make it feel more playful. A few stickers, die cuts and flair from A Flair for Buttons were all that were needed to finish it off. I backed only the word HOME to give it some emphasis. Thanks for stopping by my creative view today. 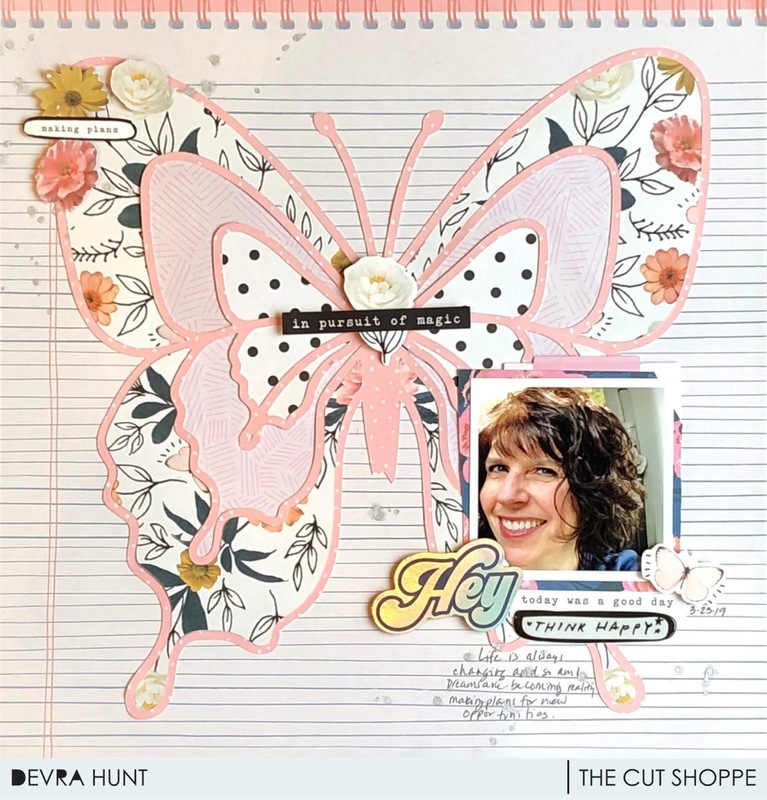 Head over to The Cut Shoppe where you can get this and so many fantastic cut files. See you back here again shortly.